I think my top choices for the year are going to end up showing a lot of children. 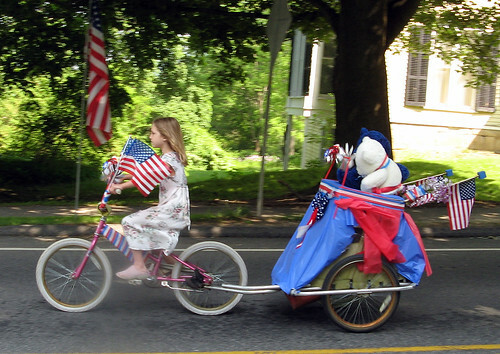 But this photo is the perfect summation of the many wonderful public events we've had in Sharon this year - including the Sharon Classic Road Race, the craft fair, and the Fourth of July parade, which this picture is from. There will be themes I don't get to show in this list - I often show closeups of flowers blooming, which I could argue represent the changing seasons here. But they also could be taken anywhere in the northeastern quarter of the country, so I won't use up one of my precious top few slots showing a rose or a lily. However I also might not get to show mountains in the mist, or brilliant fall foliage, or Mudge pond, or the twin oaks - all favorite and iconic images of my town. On the other hand, I haven't made my final choices for the top three - anything could happen. This is such a touching photo. I just love it. It's one of the best way to stand for a national flag. That sure is a nice photo. And it spells America in a big and nice way. A great picture. I am sure the little girl took a lot of time to decorate her bike and was very proud of her entry into the parade, as she should be.